If your recent ancestry lies outside of Africa, you can safely assume that you carry some Neanderthal DNA. 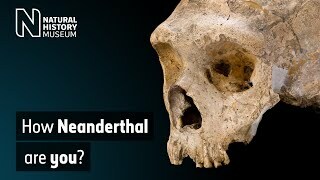 Human origins expert Professor Chris Stringer discusses what this Neanderthal inheritance may have meant for the early modern humans who migrated out of Africa, and what it means for us today. 'Genetic research shows that most people outside of Africa have about 2% Neanderthal DNA,' says Prof Stringer. What is this DNA doing? Interbreeding may have helped early modern humans adapt quickly to new environments, by acquiring genes from Neanderthals who had lived there for many thousands of years. Some of the DNA is found in parts of the human genome that are associated with skin and hair, maybe giving our ancestors thicker hair and skin that helped them cope better with the colder climate. Other DNA inherited from Neanderthals seems to be involved in boosting immunity, perhaps providing a quick fix against local infections. But it's not all good news. Neanderthal DNA in modern humans seems to also be associated with diseases such as diabetes, lupus and Crohn's disease, which causes inflammation of the gut. The negative effects in modern humans may have been triggered by changes to our lifestyles over thousands of years. It seems that our Neanderthal inheritance has brought both benefits and disadvantages.